EHS junior Alyson Bailey attempts a two-pointer in front of Belpre’s Kyanna Ray, during Eastern’s 59-53 loss on Saturday in Belpre, Ohio. BELPRE, Ohio — For the first time since joining the Tri-Valley Conference Hocking Division, Belpre has won the battle of the Lady Eagles. The Belpre girls basketball team — which began TVC Hocking play in the 2010-11 season — claimed its first victory over Eastern in league play on Saturday afternoon, winning by a 59-53 margin in Washington County. 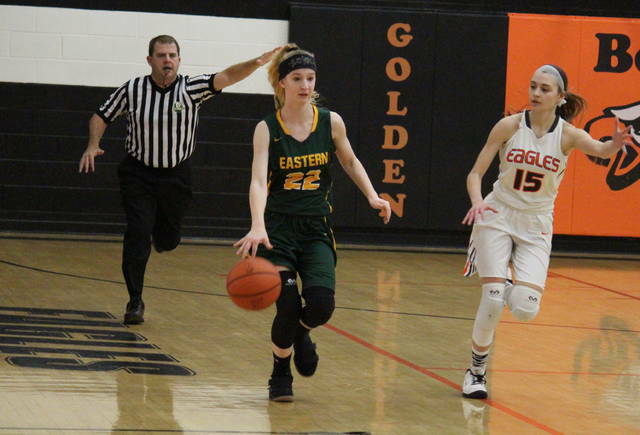 Eastern (4-2, 4-1 TVC Hocking) — which had won four straight games headed into Saturday — started out on the right foot, jumping out to a 19-8 lead with seven different players scoring for the guests in the opening period. Belpre (4-2, 3-1) began fighting back in the second quarter, cutting the EHS lead to 29-23 by halftime with a 15-to-10 run. BHS carried the momentum into the third quarter, outscroing the guests 18-to-11 in the period, giving the hosts a 41-40 lead with eight minutes to play. The Orange and Black began the finale with a 10-4 run, expanding their advantage to 51-44 with 5:11 to play. Eastern scored eight straight points over the next 2:16, with an Alyson Bailey put-back two-pointer giving the guests 52-51 lead with 2:55 remaining. Bailey’s basket was Eastern’s final field goal, however, with the visiting Lady Eagles— who had three starters foul out during the fourth quarter — sinking just 1-of-5 free throws over the final 2:55. Belpre regained the lead with a Kyanna Ray three-pointer with 2:25 left and never trailed again, sinking 5-of-10 free throws after that to seal the 59-53 victory. Eastern shot just 17-of-83 (20.5 percent) from the field, including 2-of-17 (11.8 percent) from three-point range. Meanwhile, the hosts shot 19-of-42 (45.2 percent) from the floor, including 6-of-19 (31.6 percent) from beyond the arc. Both teams shot 29 free throws in the contest, EHS sinking 17 (58.6 percent) and BHS making 15 (51.7 percent). The Green, White and Gold won the rebounding battle by a 35-30 clip, including 21-to-6 on the offensive glass. EHS committed just 10 turnovers in the game, six fewer than the hosts. The guests claimed a 9-to-4 edge in steals, while dishing out 10 assists and blocking one shot. 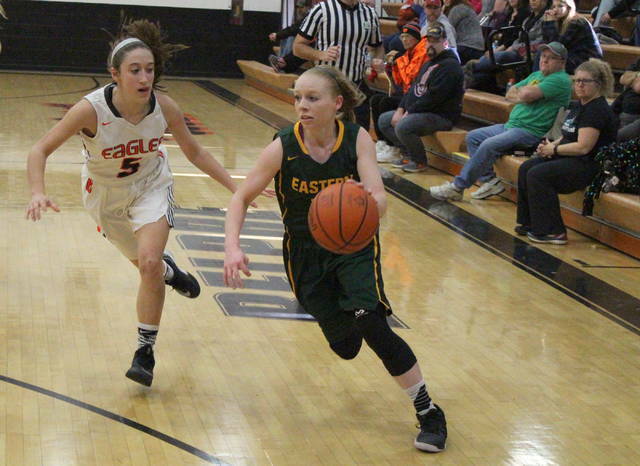 EHS junior Jess Parker hit both of the Lady Eagles’ three-pointers and came up with a team-best 17 points. Elizabeth Collins was next with 16 points on the strength of 12 field goals, while pulling in a team-best 20 rebounds. 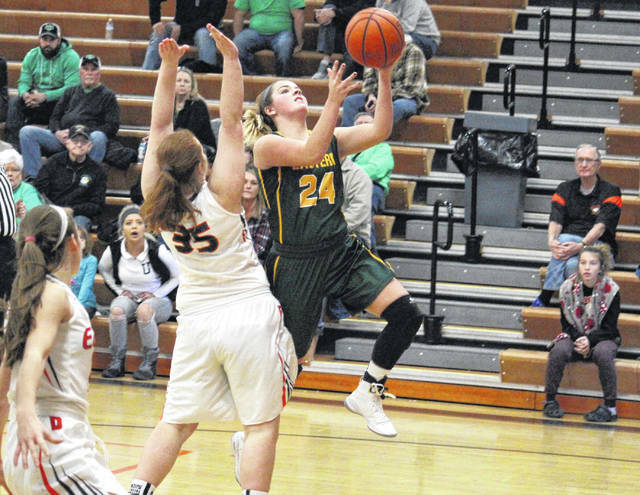 Bailey recorded eight points and a team-best four assists, while Madison Williams added six points and led the EHS defensive effort with three steals and one block. Kaitlyn Hawk scored four points for the guests, while Kelsey Casto and Whitney Durst marked a point apiece. 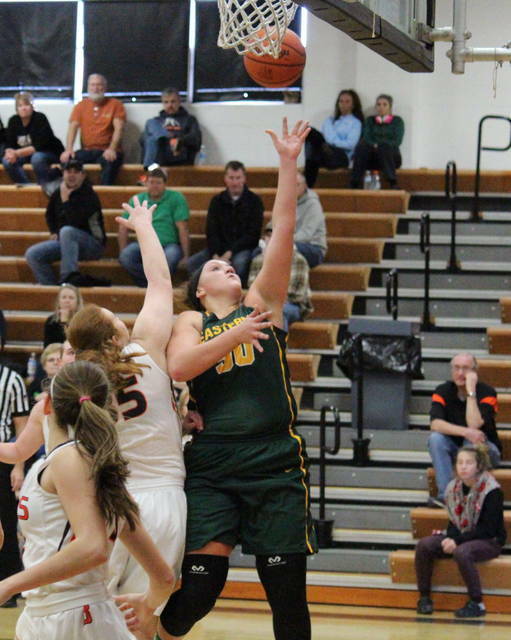 BHS sophomore Kyna Waderker led the hosts with 17 points, followed by Abbey LaFatch with 13 and Ray with 11. Sydney Spencer scored eight points in the win, while Lakin Hupp and Curstin Griffin had five points apiece. Eastern will look to avenge this setback on Jan. 25 at ‘The Nest’. After hosting Wahama on Monday, Eastern will travel to Federal Hocking on Thursday.